These were supposed to be called “Secret-Ingredient-Chocolate-Chip-Cookies”, but as my 5 year old astutely pointed out with an exasperated look on her face, I gave away the secret in the photo! 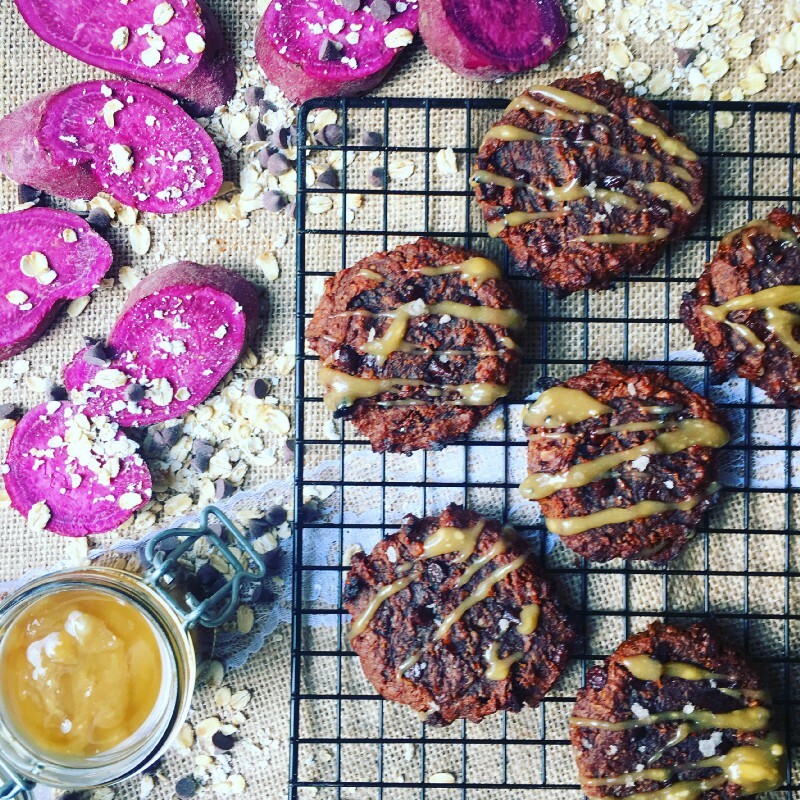 Having just discovered the wonder that is a purple sweet potato, here are my vegan, gluten-free cookies drizzled with Tahini Salted Caramel that are so very delicious I did a victory skip around my kitchen whilst eating one! Each cookie provides 190 calories, 5g of plant based protein, 4g of fibre and an enormous 56% of my daily Vitamin A requirement. You might be forgiven for thinking that those macros belong to some sort of salad, but no! All from the most deliciously gooey chocolate chip cookie that I have ever made! It’s quite rare that I get as excited over a new creation but I feel like this warrants all of the exclamation marks! They have the perfect combination of complex carbs from the oats, healthy fats and anti-inflammatory Omega 3’s from the walnuts and high amounts of Vitamin A from the sweet potatoes. While all sweet potatoes are very high in Vitamin A and many other micronutrients; their main nutritional benefit, and the one for which purple sweet potatoes are especially prized, is their high antioxidant levels. Anthocyanin is the antioxidant pigment responsible for the amazing bright purple colour, and is the same pigment that gives blueberries, red grapes and red cabbage their wonderful colour too. And don’t even get me started on the Tahini Salted Caramel drizzle….it lasts for ages and once you’ve made it, you will find an excuse to put it on every single damn thing you eat, including your finger straight outta the jar! · Put the steamed sweet potato, banana, soaked dates, vanilla extract and hazelnut butter into a food processor and blitz until smooth. · Add the sweet potato mixture into the large bowl and mix well. · For the Caramel drizzle — put all of the ingredients into a small saucepan and heat on a low heat for 5 minutes or until melted. · Whisk together to fully combine. Drizzle on top of the cookies and store the leftovers in an airtight glass jar.